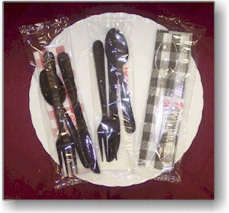 Max Packaging offers a complete line of dinner kits for all your needs. Our dinner kits come in a wide selection and can also be customized by adding just about anything you can think of for all occasions. Don't forget you can also take your choice of a wide variety of colors napkins to wipe away the crumbs. Heavy weight black cutlery is perfect for any application. Add a gingham napkin and you have the ideal combination. We have even included salt, pepper and a toothpick for your convenience. Max Packaging rolled napkin kits are now available. Whether for catering, dine-in, or special events, our rolled napkin kits are sure to deliver a sense of style and occasion! Max Packaging’s stock kits are prearranged five and six piece kits. These kits are a great way to find just the right combination for you without needing to create a custom kit. Stock kits are available across our entire range of cutlery.